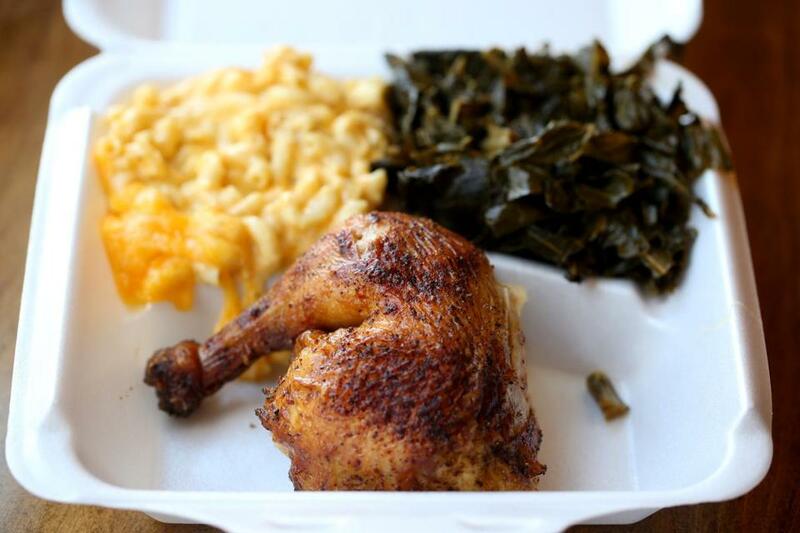 Chicken with mac and cheese and collard greens at The Rotisserie in Dorchester. There’s no pork at The Rotisserie, a soul food restaurant in Dorchester. And where collard greens might typically be sauteed with ham or bacon fat at another soul food establishment, here they’re cooked with turkey. Paprika-seasoned chicken is slow-cooked on a rotisserie, rather than fried. And if you choose two starch sides, like mashed potatoes and candied yams, instead of one non-starchy vegetable and one starchy, you’ll be charged $1 extra. Welcome to the emerging trend of healthier soul food. Often maligned as unhealthy, soul food is undergoing revitalization. Soul food restaurants around the country are reducing fat and pork, some even going so far as to serve only vegan dishes. At the forefront is Soul Vegetarian in Chicago, which is more than 30 years old. The Seasoned Vegan in Harlem, in New York City, opened a year ago and prides itself on serving what it calls “gourmet vegan soul food.” The Florida Avenue Grill in Washington, D.C., a 71-year-old institution, offers vegan collards and vegan lasagna alongside classic fried chicken and fried catfish, chitterlings and pigs’ feet. Miller, a former lawyer and Washington, D.C. policy wonk, spoke about soul food during a recent visit to Boston. His book “Soul Food: The Surprising Story of an American Cuisine One Plate at a Time” won a 2014 James Beard Foundation award. For research, Miller read 3,000 African slave narratives, 500 cookbooks, and checked out 150 soul food restaurants in 35 states. Miller’s research draws attention to the historic role of blacks in American kitchens, says Joanne Hyppolite of the Smithsonian’s National Museum of African American History and Culture in Washington, D.C., which will open in 2016. “African-Americans had a presence in everyone’s kitchen since slavery, in private homes and on plantations. I see other scholars try to get away from the term ‘soul food’ as being something invented as part of the black power movement.’’ But she sees this as causing problems; the general public doesn’t see the regional variety and diversity of the food. 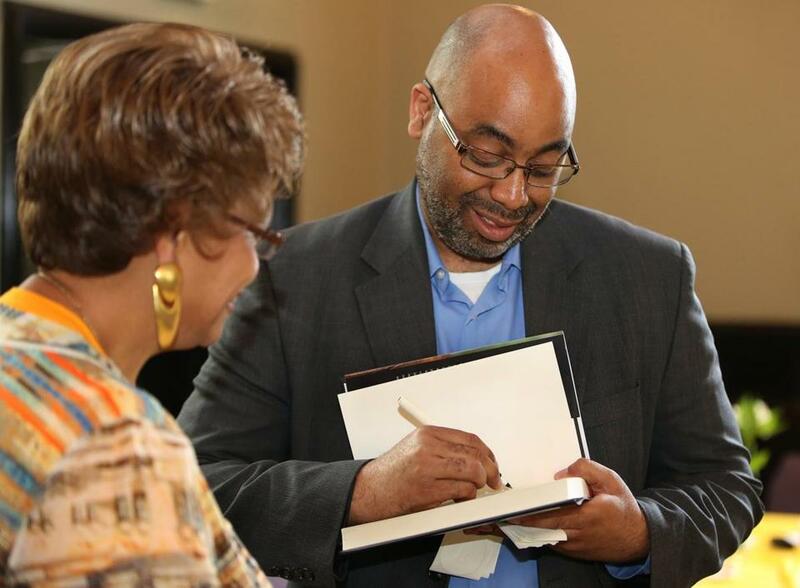 Adrian Miller autographs his book on soul food for Carole Copeland of Lakeville. The Rotisserie doesn’t have the upscale chicness of Blue Ribbon or Sweet Cheeks Q. There are four small tables; it’s more take-out than dine-in. Huntley-Connally says “the king and queen’’ of customer preferences are the chicken, and mac and cheese. A whole chicken plus three sides costs $24.99. The chicken is flavorful, not too salty, and almost fall-off-the bone tender. The mac and cheese is a creamy delight. In Miller’s book, there are three mac and cheese recipes, two traditional and one heart-healthy, among 20 other recipes. He’s now working on “The President’s Kitchen Cabinet: The Hidden History of African American Presidential Chefs,” a second book in a series of five.